Chelsea Rare Coins will meet and beat our competitor's pricing on your silver. So if you are looking to buy or sell silver (silver coins, silver bars, etc), contact us! 10 ozt Engelhard bars. Styles Vary. Please call us at 800-666-0348 for current pricing. Mint Sealed Monster Box (500) of American Silver Eagles!! Please call us at 800-666-0348 for current pricing! Currently at Spot +$2.99. 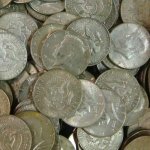 US 90% Silver Dimes/Quarters/Halves!! Any Amount!